Baked falafel couscous bowls are a simple and flavorful weeknight dinner recipe that the whole family will go crazy for! 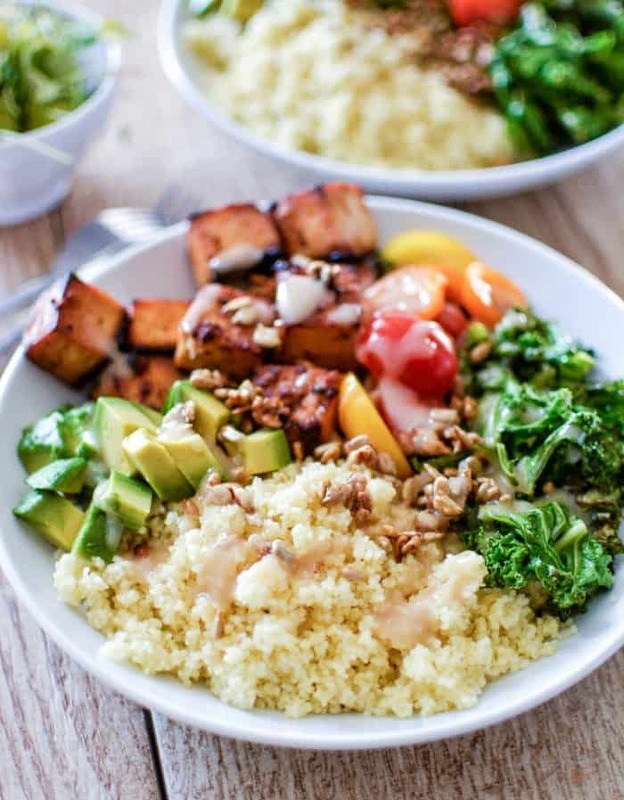 This vegetarian dish has all of the bells and whistles. 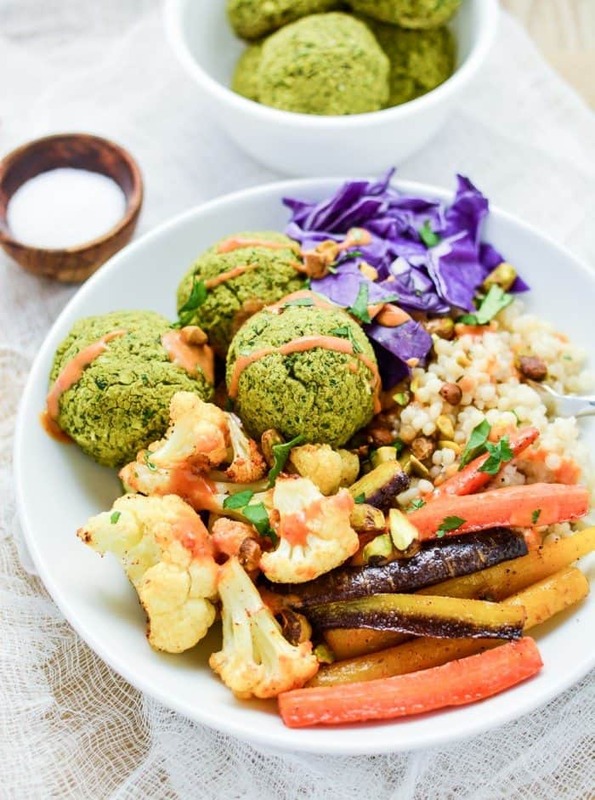 From roasted carrots to tender couscous, and baked falafel to a creamy peanut dressing, these bowls are loaded with texture and all kinds of healthy goodness! Good morning, Melrose Family readers! How has the new year been treating everyone?! I feel like I’m definitely over the winter season. I can’t believe I’m saying this, since I go crazy for snow, but I’m ready for the summer. What’s more, I am ready for fresh produce. I don’t know about you guys, but I’m tired of terrible produce. Oh sure, you can still get a head of lettuce, a bunch of green onions, and citrus tends to be better this time of year, but I am ready for the seasonal veggies: the veggies that you crave all winter long. Once I start seeing all of my favorite spring and summer fruits and veggies grace the shelves of the farmer’s market stand, I know that we have finally made it. 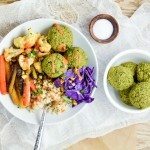 These baked falafel couscous bowls are my attempt to stay as fresh as possible during this long winter season, and they are oh so spectacular! This recipe is so very simple, and what’s even better is that the falafel themselves can be made ahead of time! 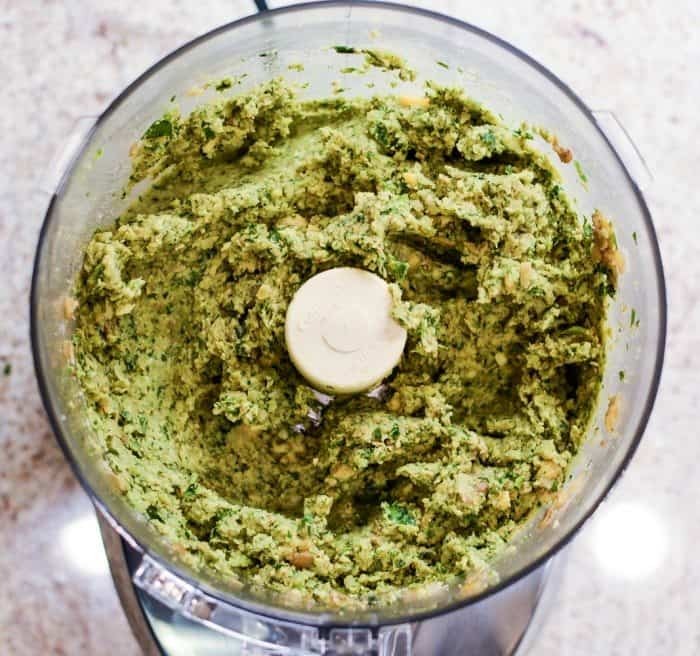 You just have to add the ingredients to your food processor. …scoop into equal-sized balls and bake! They are the perfect morsels for bowls such as these baked falafel couscous bowls, in a simple salad, or on a traditional falafel sandwich. I’ll eat them all by themselves, drizzled with my favorite vinaigrette and a side of greens! It really is delightful. I think that falafel can get a bad reputation some times. I’ve had some pretty terrible falafel, and all to often it is very dry and just unappetizing all together. I also think that it’s a common misconception that it takes a while to make, and can be a hassle. 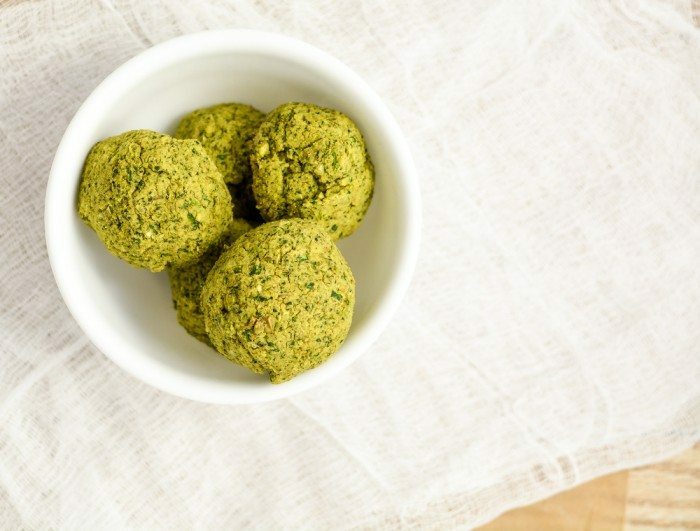 This falafel recipe is very simple, only requires a few ingredients, and can be refrigerated or frozen for use at a later time. It combines both chickpeas and cooked lentils, and contains some of my favorite herbs. 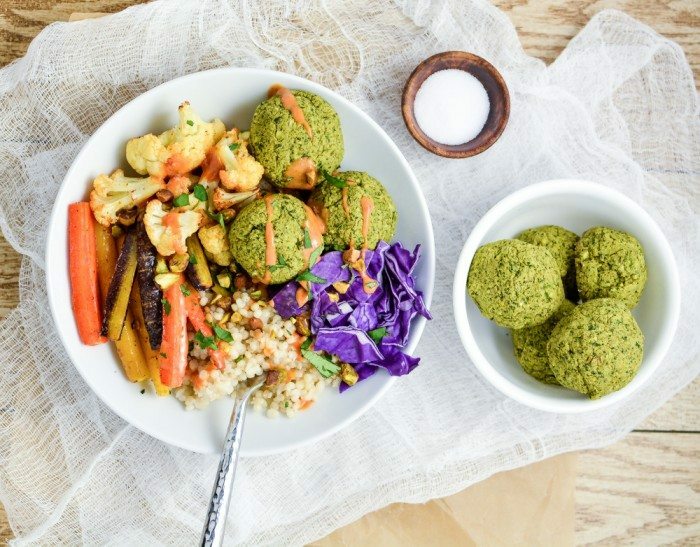 If you are looking for a super flavorful vegetarian dish, these baked falafel couscous bowls are for you. Roasted carrots add just a touch of sweetness. Israeli couscous gives it some oomph, and the falafel adds all of the protein you’ll need. 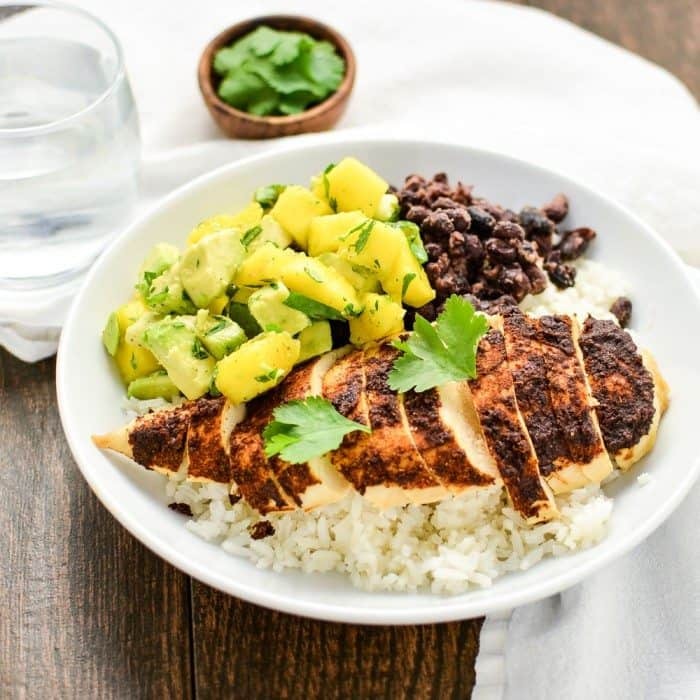 I hope you guys enjoy this recipe as much as we do. 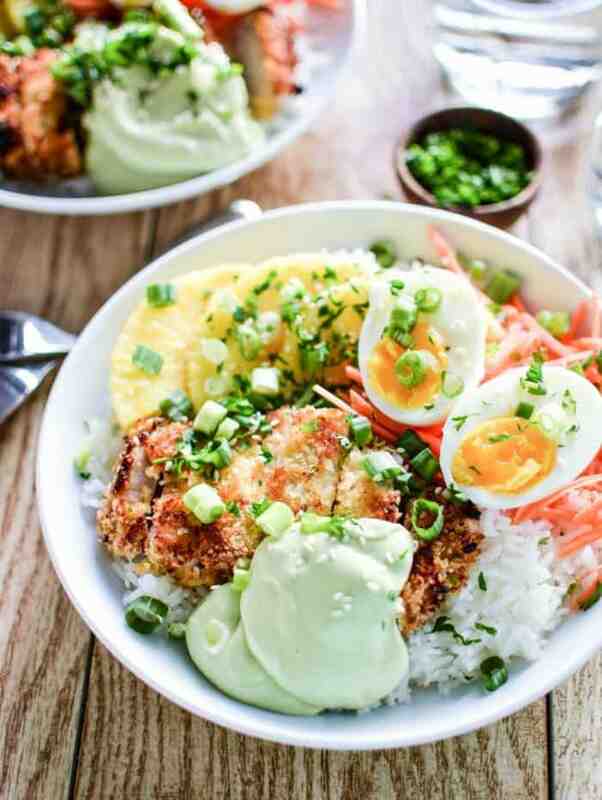 We are basically bowl fanatics around here, and these falafel bowls are one of our favorites! Give it a shot and have a wonderful day! Baked falafel couscous bowls are a simple and flavorful weeknight dinner recipe that the whole family will go crazy for! Preheat your oven to 375 degrees F and line a large baking sheet with foil. Spray it with a nonstick spray and set aside. 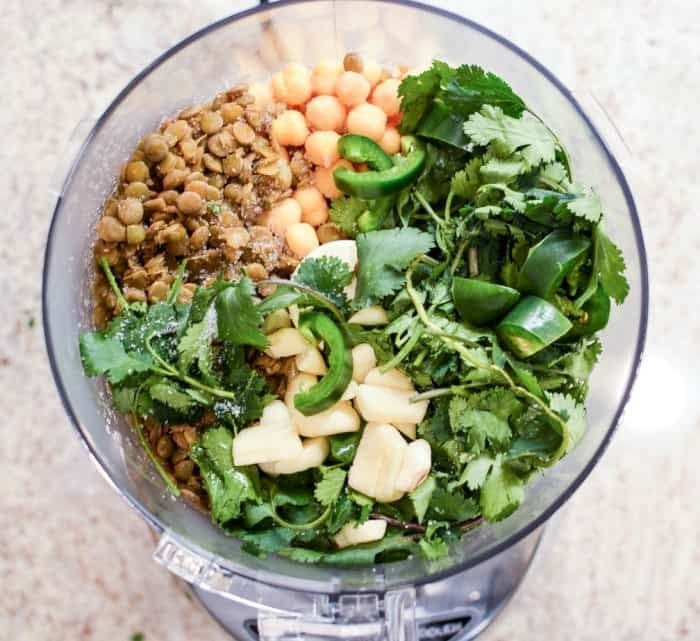 Combine the chickpeas, lentils, parsley, cilantro, garlic, jalapeno, olive oil, lemon zest, salt, onion powder, cayenne pepper and cumin in the bowl of your food processor. Pulse until the mixture comes together and is broken down substationally (about 10-12 pulses). Fold in the chickpea flour, and then form the mixture into 8 equal-sized balls. Place them on the prepared baking sheet and place them in the oven. Bake the falafel for 20 minutes and then remove from the oven to cool slightly. Preheat your oven to 400 degrees F. Line a large baking sheet with foil and spray with a nonstick spray. Place the carrots, cauliflower florets, and zucchini on the prepare baking sheet. Drizzle with olive oil and season with salt, black pepper, and paprika. Toss the veggies to combine and then place the pan in the oven. Roast the vegetables for 25 minutes, tossing them once. Remove them from the oven. Prepare the baked falafel couscous bowls by layering roasted veggies, baked falafel, red cabbage, and mixed nuts on a bed of Israeli couscous. Drizzle with creamy peanut dressing (or dressing of choice). Enjoy immediately! Like what you see today? Check out some other bowl-type recipes found over on Cooking and Beer where I’m combining bold and inspirational cooking (and baking) with the best craft beer I can get my hands on!